I’ll be the first to admit that I have a severely temperamental relationship with running. When conditions are exactly right, I’ll spend an afternoon happily zoned out in a half-marathon, but when they’re not, I can’t (or, more accurately, won’t) force myself to even get to the mailbox. Most of my conditions are comfort-related. No blisters, chafing, cinder-block-heavy shoes, or — most importantly — headphones with cords. Inevitably, the cords end up thwacking against me, entangled in my arms, or pulling on my earbuds as the phone it’s tethered to jumps up and down in my pocket. And for the most lightweight experience possible, I prefer my running headphones to be true, in-ear Bluetooth headphones — ideally the same size as a pair of cufflinks. And, for that tall order, I turn to Jaybird’s Run True Wireless Headphones. In March 2018 I called them my favorite workout upgrade. Over a year later, that’s still true. The company recently rolled out a second-generation version: the Jaybird Run XT True Wireless Sport Headphones ($179.99) which are fully IPX7 (read: waterproof). To see how they stacked up, I took them along on my workouts for the last few weeks. Customize how your Jaybird’s sound with in-app EQ options. The major pro of the Jaybird Run True Wireless buds is that they’re entirely cordless. And for truly wireless in-ear buds, they feel remarkably secure — in the year that I’ve been using a Jaybird Run earbud design for workouts, I’ve never had them fall out of my ears, or feel like they were about to. This makes it easy to focus on the workout itself. The earbuds are comfortable enough to wear for a half-marathon run, as I’ve often used them. The set will arrive with various wings and tips to customize the fit to your liking. Since this is disproportionately important for an in-ear option, you may want to spend some time making sure you’re getting the fit right from the outset, rather than relying on whatever set they happen to arrive in. The right fit will impact comfort and noise isolation. The battery life is solid and there’s a quick-charge option, which makes them very convenient. You’ll get up to four hours of audio streaming per charge and up to eight hours with the included portable charging case. The travel case is indeed easy to travel with, has survived many precarious trips in my gym bag with heavy gear tumbling around on top of it, and is perfect for quick charges when you’re ready to go but your earbuds are dead. Pop them in the case for a five-minute charge and you’ll get an hour of playback. The sound is clear, loud, and customizable. I couldn’t comfortably listen with them on their highest volume, which isn’t always the case for in-ear options for me. The music sounds great, and you can tweak it in the app if the default settings aren’t a fit. You can make calls, activate a selected voice assistant, and control music without digging the earbuds out of your ears. The omni-directional mic is located on the right earbud, and all calls are handled through that earbud. You can also use the right earbud in mono configuration if you want one ear open for passing cars or other safety concerns. There’s a button on the left that activates your selected assistant, and the right side can be used to play or pause music and answer calls with a single press. If you press either earbud twice, it’ll skip forward or decline a call. To turn the set on and off, just press down on one or both earbuds for longer than three seconds. But, if you’d prefer being able to use them to control volume, just open the Jaybird smartphone app and switch the single button press to volume control. The smartphone app is actually useful. You can customize your music using the equalizer settings and even choose or share playlists if you want. Thankfully, you can integrate Spotify here. The Jaybird Run XT is also touted as a fully IPX7 version of the first-generation Jaybird Run buds— meaning that they’re now fully sweatproof and waterproof so you can take them into the elements rain or shine. You could even submerge them down to one meter for up to 30 minutes. Since the new iteration has pushed prices of the original Run buds down to as low as $120 on Amazon, my advice would be to pick those up if you don’t need or care about the IPX7 update. The Jaybird Run earbuds have their flaws. Sometimes only one earbud will connect automatically. But, far more often than not, there are no issues at all, and a simple reboot has always taken care of this issue for me. You probably won’t want to watch videos with these. A common complaint is that there’s a consistent lag where sound in videos is concerned. If you’re looking for true wireless earbuds that you can enjoy TV shows with as well, these probably aren’t them. 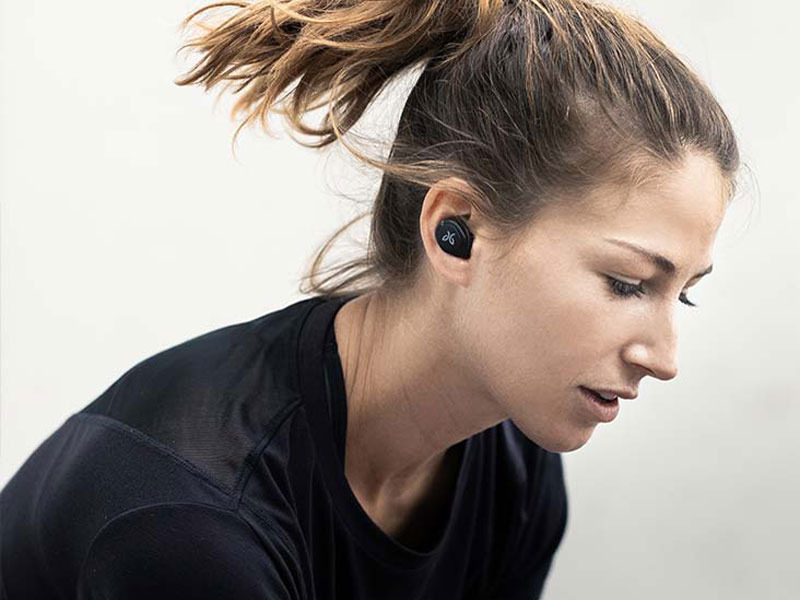 As with any truly wireless in-ear headset, the Run’s have less noise cancellation than an over-ear option. Given the convenience of the style for runs, this is something I’m okay with giving up — and with the correct tip and wing size, I don’t find it noticeable. The buttons on the sides of the earbuds can be tough to operate while running. They’re small, and if conditions are slick, you may have a harder time using them. Since I typically either turn on a playlist and let it run or skip songs, this isn’t a deal breaker. The $180 price tag isn’t ideal, but it is in the neighborhood of competitors. It’s also worth noting that given how durable they are, you can probably expect to get years of usage out of them even with vigorous workouts. If you’re looking for truly wireless earbuds you can take on long runs comfortably, Jaybird Run earbuds are worth looking into. They sound and feel great, they’re durable enough to withstand tough workouts, and they’re customizable in both fit, functionality, and sound. For my needs, the pros far outweigh the cons. They’re not perfect, but they’re the best option I’ve used for runs without cords. And if you don’t care about new colors or a fully IPX7 version of the earbuds, save yourself some money and buy the first-generation buds over the XT while you can.